The HP Color LaserJet 5550n is a superb high speed workgroup printer with versatility for your evolving business environment. Wide connectivity makes this overachiever perfect in any office environment. The revolutionary HP ImageREt 3600 technology produces professional and superior print quality. Smart features like the 500 sheet second paper tray and automatic internal sensors to optimize color density will save time and money. Printing is fast and efficient with speeds up to 27 pages per minute in black and color. 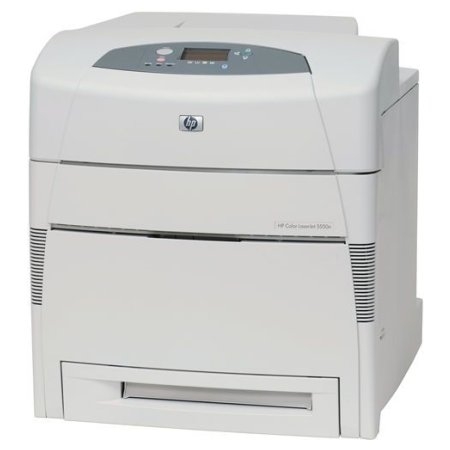 The HP Color LaserJet 5550n printer is the perfect blend of reliability and performance for a total business color printing experience. ImageREt 3600 provides color print quality to produce photo-realistic images, bold graphics, laser text and refined thin lines. Multi-Purpose Tray: 3" X 5" to 12.05" X 18.5"
25.2" X 27.7" X 22.7"